THIS IS AN INITIAL BUILD WHICH MAY NOT BOOT AT ALL. HAVE A BACKUP BEFORE FLASHING THIS AND TRY AT YOUR OWN RISK. Installing a custom ROM on a HTC One M8 (m8) requires the bootloader to be unlocked on the HTC One M8 (m8) phone, which may VOID your warranty and may delete all your data. Before proceeding further you may consider backup all data on the phone. You are the only person doing changes to your phone and I cannot be held responsible for the mistakes done by you. – Here is theTWRP update guide for the HTC One M8 (m8). This TWRP recovery guide requires an unlocked bootloader on the HTC One M8 (m8). – If you want to upgrade this Lineage OS 14.1 on top of CM14.1 ROM without wiping data then you can refer this CyanogenMod to Lineage upgrade guide. Download and Copy the GApps and Lineage OS 14.1 for HTC One M8 ROM ZIP to your phone. First flash the Lineage OS 14.1 for HTC One M8 ROM ZIP from device. Then flash the GApps zip from your device memory. Reboot and Enjoy the Nougat 7.1 Lineage OS 14.1 ROM for HTC One M8 (m8). 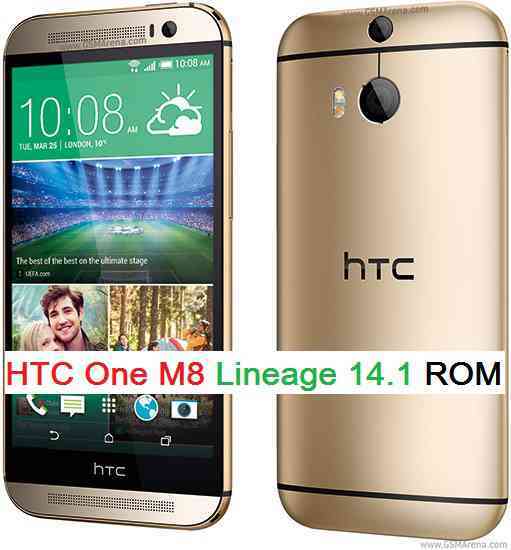 Copy the latest Lineage OS 14.1 for HTC One M8 ROM ZIP file to your phone. Stay tuned or Subscribe to the HTC One M8 (m8) forum For other Android Nougat ROMs, Lineage OS 14.1 ROMs, other ROMs and all other device specific topics. I just wanted to check and see how this was going for the m8. I tried going to the ROM download link and it doesn’t work. I’m interested in trying this out. Thanks to report the broken link. I have updated another ROM built by compuguy and also the OFFICIAL Lineage 14.1 for One M8. Which would you recommend? Is there anything that isn’t working on these? Tried putting the official experimental on top of CyanogenMod 14. Lineage hangs on first boot. This was using lineage-14.1-20170130-experimental-m8-signed.zip . I’ve flashed this ROM to my M8 phone and then flashed the gApps zip file. And now when I boot up, it says “No Sim Card – No Service”. My Sim card is in the phone, but I am not connected to TMobile. I figured this problem out. I had to go into my Cellular Networks and select my Network Operators and now it works!! I think the experimental build is only needed if you want to migrate from CyanogenMod 14.1 to Lineage OS 14.1, otherwise you should download and flash the NIGHTLY build. Thanks for the response. I am trying to go from CyanogenMod 14.1 to Lineage OS 14.1. I assume my other option would be to wipe the phone and install the Nightly if I can’t get experimental to boot.